Heads will be collectively scratched in Washington on Friday at a mystery. Why do the world's elites not spot an emperor with no clothes on? As the great and the good gather for the Spring Meetings of the World Bank they will also be mulling over what the international development agenda could or should look like after the expiry of the Millenium Development Goals (MDGs). They are not short of ideas, as we saw in London when the High Level Panel of Eminent Persons established by the UN Secretary General were subjected to a two hour mass lobby. Tony Blair recently said "to decide is to divide" and there is no doubting the difficulty of making the priority call on a long list of vital issues to include in the next global set of targets to measure how the world is doing by its most vulnerable and poorest citizens. Yet there is one subject, almost uniquely, that both the elite and the development lobby agree on: we have to do something about conflict. A quick look at the MDG league table reveals the stark reality that the poorest and most vulnerable have been left behind by the old way of doing things, with no conflict affected country set to meet a single MDG. It's not difficult to see why. 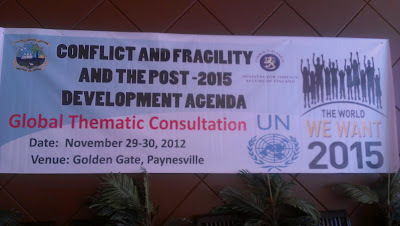 Conflict is political but the MDGs are technical. Conflict takes generations to tackle, but the MDGs set a 15 year deadline. In short conflict goes to the heart of the relationship between the governing class and the governed. And that raises all sorts of tricky questions. Best stick with counting the schools we've built. Even if the children can't get to them for fear of kidnap. And, worryingly, the emerging post 2015 consensus seems to be repeating the mistake if you judge by recent communiques, speeches and statements.What seems obvious - a development goal on peace - is being quietly side-stepped. Last year the chief author of the MDGs, Mark Malloch-Brown, told me that for the next generation of development goals to tackle the political, long term and tricky issues of governance would be the achievement of a generation. And those countries affected by conflict agree, with the G7+ group of nations having formed a new partnership with donors called the New Deal for Engagement with Fragile States, or the New Deal for short. It sets out a new partnership for doing development, based on transparency, local ownership, accountability and trust. Mutual accountability mechanisms need to established between donor and recipients based on transparency and trust. "...significant – and welcome – contribution to a more equitable and productive partnership between fragile states and their development partners"
"The New Deal for Fragile States, which [the g7+] have developed from the very beginning, is an exciting and fresh approach that has the chance to deliver real results." The problem is, it hasn't. At least not yet. Implementation has been slow and meetings designed to steer its implementation have started to be characterised by a lack of willingness by governments to engage local civil society while at the international level there seems to be a conspicuous lack of reference to the New Deal in almost any post 2015 debate. While I was at the UN Global Thematic Consultation on Conflict, Fragility and Disaster in Liberia last year, President Sirleaf had to make a personal intervention before it was put on the agenda at all. Powerpoints were hurriedly updated over dinner. Are we in danger of repeating the same mistakes of 2000? Amid the enthusiasm at the new way of working represented by the New Deal we knew this point would come. Power politics was always going to take centre stage. Muscles flexed and quiet words had. What are some of the key achievements, opportunities and challenges to deliver change through the New Deal at the country level? What can the New Deal and the International Dialogue contribute to redefine the new development agenda? How can states and societies affected by conflict and fragility best make their voices heard, taking a lead role in shaping such an agenda? What does it take to implement the New Deal? Difficult questions, all. But with a participant list consisting of the global policy making elite, who themselves will be joined by Ministers from across the world, including fragile states, Friday will be the time to ask them. If you're in Washington, go along. The event, billed as "The New Deal: Achieving better results and shaping the global agenda", will take place at the Willard Hotel, 1401 Pennsylvania Ave NW between 1400-1600. There may be sandwiches. You have to hope the answers coming back from the panel inspire more confidence than many of us trying our best to support this process feel at the moment. 1.5 billion people depend on them. The emperor must be clothed.